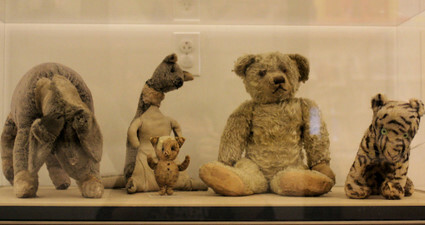 When A.A. Milne first wrote of his son’s teddy bear, little did he know the cultural icon Winnie the Pooh would become. Starting with poems in When We Were Very Young (1924) and Now We Are Six (1927), the author continued the character’s adventures in the story collections Winnie-the-Pooh (1926) and The House at Pooh Corner (1928). 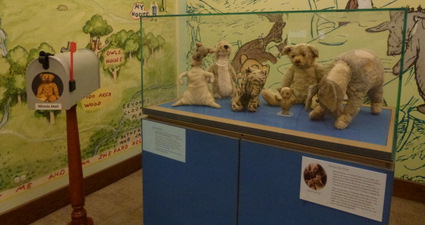 As with Pooh, Milne looked to the stuffed animals owned by his son, Christopher Robin, for characters such as Tigger, Eeyore, Piglet, Kanga, and Roo. These stories were further brought to life by the charming illustrations of E. H. Shepard. On January 6, 1930, Milne and Stephen Slesinger reached a landmark licensing deal. Slesinger obtained the U.S. and Canadian merchandising, television, and recording rights to Milne’s Winnie the Pooh stories, in exchange for a $1,000 advance and 66% of Slesinger’s income. By November 1931, Pooh merchandise was collecting close to $50 million each year. Quickly, the character was capturing the hearts and minds of children – and gaining the attention of a certain imaginative studio. Walt Disney Productions wanted Winnie the Pooh. In 1961, Slesinger’s widow, Sherley Slesinger Lasswell, licensed the character’s rights to Disney, in exchange for royalties. That same year, A. A. Milne’s widow, Daphne Milne, granted Disney the motion picture rights. Under this agreement, the studio crafted three Winnie the Pooh featurettes: Winnie the Pooh and the Honey Tree (1966), Winnie the Pooh and the Blustery Day (1968), and Winnie the Pooh and Tigger Too! (1974). With bridging material and a new ending, these shorts were assembled together and released theatrically as The Many Adventures of Winnie the Pooh on March 11, 1977. A fourth featurette, Winnie the Pooh and a Day for Eeyore, arrived in 1984. Afterward, Pooh became the star of the TV series Welcome to Pooh Corner (1983-86), which blended live-action actors in costumes with animatronics, and the traditionally animated New Adventures of Winnie the Pooh (1988-91). In August 1997, he returned to features, courtesy of the direct-to-video Pooh’s Grand Adventure: The Search for Christopher Robin. 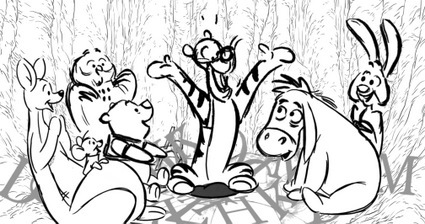 From there, a series of movies were released theatrically: The Tigger Movie (2000), Piglet’s Big Movie (2003), and Pooh’s Heffalump Movie (2005). Concurrently, Disney Channel continued to make Pooh a vital part of their Playhouse Disney lineup. The Book of Pooh hit TV screens from 2001 to 2002, utilizing Japanese bunraku puppetry. 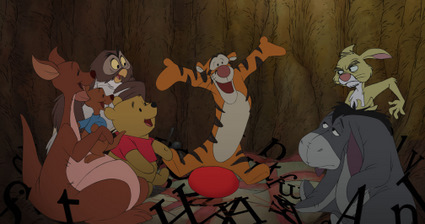 Next, the computer animated My Friends Tigger & Pooh (2007–2010) arrived, pairing the title characters with six-year-old Darby and her dog Buster. Meanwhile, Winnie the Pooh as a brand became one of Disney’s largest, second only to Mickey Mouse. What once gathered $50 million each year grew to collect over $6 billion annually in global retail sales. Nonetheless, John Lasseter, Chief Creative Officer of the Walt Disney Animation Studios, felt it was time for Pooh to return to his roots. Specifically, it was time for the “tubby lil’ cubby all stuffed with fluff” to return to his carefree days in the Hundred Acre Wood, as Christopher Robin’s simple-minded yet loyal best friend. Hence, a direct follow-up to The Many Adventures of Winnie the Pooh was planned. For this ambitious effort, Lasseter called directors Stephen Anderson and Don Hall. Anderson joined Walt Disney Feature Animation in 1995, as a story artist on Tarzan (1999). Later, he served as a story supervisor on The Emperor’s New Groove (2000) and Brother Bear (2003). For his directorial debut, Anderson took on Meet the Robinsons (2007), an adaptation of William Joyce’s picture book A Day with Wilbur Robinson. 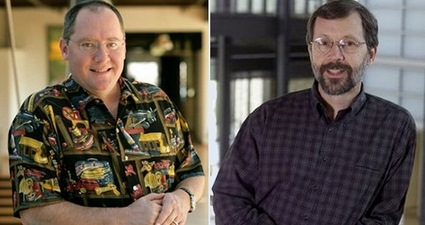 Robinsons was also the first project Lasseter executive produced, after joining Disney in 2006. As for Hall, he likewise joined Disney in 1995, as a story trainee for Tarzan. This lead to his Annie-nominated work as a storyboard artist on Groove, before earning a second Annie Award nomination as the head of story on Robinsons. Thus, it was with great pleasure that Anderson and Hall teamed once again, to bring new life to one “silly ol’ bear”. Animated Views: How did you become the directors of Winnie the Pooh? Stephen Anderson: We were lucky enough to, obviously, have the trust of John Lasseter. When the company decided they wanted to bring Winnie the Pooh back to the screen, he called Don and I and said, “We’d like for you to take a look at this.” At the time, we didn’t quite know what form it was going to take. We thought it might be a series of shorts for the Disney Channel or for DVD. But we just dove in, and we established the mantra of returning Winnie the Pooh to his roots. That was our marching order from John, so that’s what we set about to do! AV: Pooh has gone through several versions since 1977, including Super Sleuths [My Friends Tigger and Pooh], where he was computer animated. Did this make it challenging to bring Pooh back to his roots? Don Hall: Well, we had the support of everybody, because everybody felt like that was the way to go. 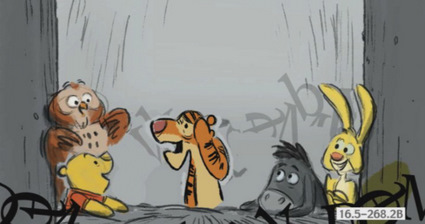 What was maybe more intimidating when we first took over was, were there more “stones to turn over” for Pooh? Were there more stories to tell? When we actually did our research and read all the Milne books, we started uncovering some stories we felt really hadn’t been exploited. Then I think we felt a little better. Also, when we absorbed the characters, we felt pretty confident that these were broad-audience stories. We were laughing out loud at the book, so we were pretty confident we could make a broad-audience movie out of it. AV: How did you decide to hire Robert Lopez as the songwriter? Was there any concern, since he is mostly known for more mature works like Avenue Q? DH: No, there wasn’t any concern. We sent visuals to about five teams of songwriters. We got some demo songs back. They were all really good. But Bobby and Kristen’s was great. We felt like they got the wit and the charm. They were really funny; they could bring a little bit of irreverence to it. They were just really excited to do it. We fell in love. It was love at first sight. AV: Can you name some of other songwriters you considered? DH: [laughs] I don’t think that would be prudent of me to do. AV: I’m going to guess Alan Menken and Randy Newman. AV: [laughs] All right. 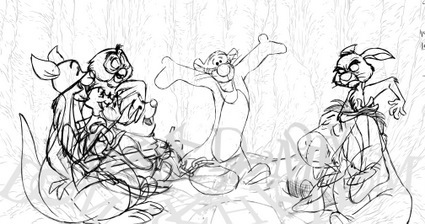 Some fans have asked why characters such as Rabbit, Owl, and Eeyore were recast. Could you provide any thoughts there? 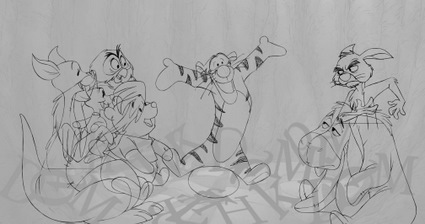 SA: One of the things we felt we could really bring to the Winnie the Pooh world was humor. The Milne stories were very funny, and the original shorts were very funny. We thought, “Let’s just take a cue from that and keep pushing the humor.” We felt, if we were able to do that, it would make the film really relevant for today. As we looked at the cast of characters – as much as we love them all – we thought, in the classic films, Rabbit and Owl could possibly be funnier. Maybe they weren’t quite pulling their weight comically. We looked at ways to enhance their personalities – not change them, but bring more of the egomaniac in Owl and more of the control freak in Rabbit out in the movie. A lot of that came from our story artists, as they were writing the film. 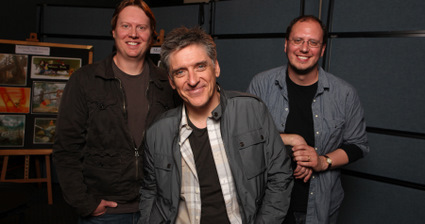 A lot of it came from casting, bringing in Tom Kenny as Rabbit and Craig Ferguson as Owl. They really opened up a lot of new entertainment doors for us, in terms of how to work with those characters. It was just how we felt we could make the film work for today’s audiences. AV: I also noticed Christopher Robin has a new look. 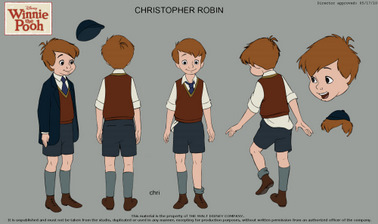 DH: We looked at all the versions of Christopher Robin through the past. We decided not to go with the “dot” eyes, because we felt that made him almost doll-like. He’s not a doll; he’s a real boy. Pooh is a doll; Piglet is a doll. Also, with the “school boy” look, we liked that it gave him an identity, almost an occupation. It was a look we could manipulate. In the morning, he’s got his jacket on, and he’s ready to go. When he comes back in the afternoon, he’s a little bit more rumpled; his shirt tail is out. It was a way we could show passage of time. AV: Both of you have worked at Disney since the late ’90s. Could you elaborate on some ways the studio has changed throughout the years? DH: Yeah, we’ve lived through different regimes. As for John and Ed Catmull, I don’t know how many years it’s been – four or five years – since they assumed leadership. But it’s been a sea of change in attitude and love for the medium. There is nobody on earth who loves animation more than John Lasseter; actually, there is no one on earth who loves Disney animation more than John Lasseter. He’s a fan, but he’s also a filmmaker. He knows what filmmakers go through. Having somebody like that in your corner has made all the difference in the world. SA: One of the things I noticed when Don and I started almost the same day, each movie production felt like their own little world, their own little island. It didn’t always feel like there was a lot of communication between each movie, or sharing of information or collaboration between projects. Each one was defended like a fortress. 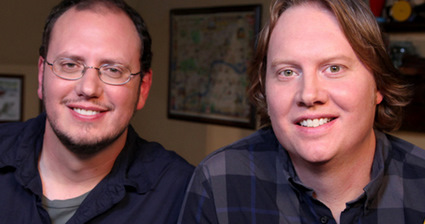 I think we’ve seen that change over the years, especially now that John and Ed are running the studio. There’s much more of a sense of community here. Even though I might not be working on someone else’s movie, for example, it’s still our movie, because it’s coming out of our studio. Since we all work here, and we all believe in each other, we’re all in it together. We help each other out on movies, and we give each other feedback. There’s a really great communal sense here at the building today. AV: You know, one of my favorite movies is Meet the Robinsons. AV: When I saw Robinsons, at the end, I don’t think there were many dry eyes in the theater. So I want to ask you a little about it. During its production, you worked under David Stainton and then John Lasseter. How did that change in supervision affect your direction on the film? SA: By the time John came in, I think we were about 80% of the way through animation. We were pretty far down the pike, prior to John coming. What John really gave us was the chance to objectively look at the movie and find places we could strengthen. We weren’t going to be able to do too much to it, because it was still about a year from release. But things like strengthening the sense of antagonism in the film and bringing the character Doris the bowler hat more to the forefront, making her the primary villain, really helped raise the stakes for the film and give it more of a threat. That was one specific note John and the Pixar team had given. We were able to go through and enhance some of the moments in the film for emotional impact as well as dramatic impact. AV: Did you have any involvement with the sequel that was planned? SA: I had gotten the pitch, while we were still making the first film. But it was really early in development. It was just more of a notion – not really much involvement in creating it. AV: The sequel had something to do with a “first date”, didn’t it? I think even the subtitle was First Date. SA: It might have. I can’t remember, that was so long ago. It was only one meeting. We were so busy at the time, I don’t have much of a recollection of it. AV: Do you recall if you were going to play Bowler Hat Guy again? SA: I don’t know. [laughs] I hadn’t really thought of that. DH: This is all new information to me! I had no idea about any of this! SA: [laughs] Yeah, and Don was a story supervisor on Meet the Robinsons! AV: Now that Disney has brought new life to Winnie the Pooh, what are the chances they’ll do the same for Mickey Mouse? Any plans for a new feature there? SA: Like Don said, John is such a fan of classic Disney. If there’s potential to play with some of those classic characters even more than just Winnie the Pooh, I think he’d be really excited to do that. AV: For my final question, I want to ask what a lot of folks have wondered: What was the idea behind opening Winnie the Pooh against Harry Potter and the Deathly Hallows? I understand the idea of counter-programming, but it seems like more people would see Pooh if Potter weren’t an option. 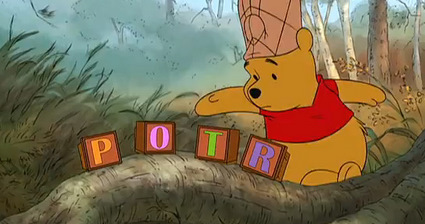 Pooh spies an intriguing set of blocks in one of the film’s TV spots. DH: Yeah, it’s a bit of an experiment. I don’t think anybody in their right mind would relish going, opening weekend, against Harry Potter. Obviously, I don’t think anybody is expecting us to win the weekend. [laughs] I think, ultimately, they are for different audiences. Potter has gotten much darker as the series winds down and appeals to a little bit older crowd. We’re just trying to go for a more general audience. I think Steve and I both relish it a little bit. It puts us smack-dab in this summer full of superheroes, robot cars, explosions and all that kind of stuff. We kind of like being this little rebel, gentle movie that comes out amidst all that chaos. I think Tom Kenny referred to us as “punk rock”. DH: We’re like “the Ramones of the summer movies”. I thought that was brilliant. That was so funny. SA: We firmly believe, too, that it was the studio reacting based on the faith they had in the movie. It was less about, “Can we take down Harry Potter?”, and more about, “When is the best time to open it? When is the opportunity for the most people to see the movie?” They felt, you put it in the thick of the summer. July is the month where everybody is off from school. Most people take off from work to go on family vacations. It’s the widest possible window we could have to build an audience and to have a steady life out there in the theater. That was really the method behind it. It was less about competition and more about how can we get the movie in front of the most people. 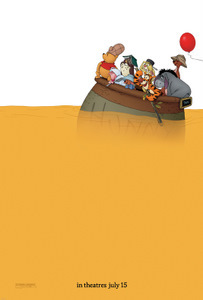 AV: If reviews are any indication, it looks like Pooh is going to have great legs at the box office. is now playing in theaters. Special thanks to Stephen Anderson, Don Hall, and Samantha Fisher at WDAS! Pooh characters at the NYPL photo is courtesy of StitchKingdom.com.